Europe – Place For All Youth! - Stowarzyszenie Młodzieżowych Inicjatyw Twórczych "CREATOR"
Europe – Place For All Youth! SMIT "CREATOR" members were participating in a TC titled Europe – Place For All Youth! co-ordinated by European Youth Center of Vojvodina and held in Novi Sad, Serbia. The main idea: Education of young people about tolerance in terms of origin, religion, sexual orientation, social status or ethnic minority issues. Raising the awareness of the participants about what it means to be “Young European” whether they are from an EU country or not. Empowering young people to overcome the lack of social factors that affect demotivating and stigmatizing in meeting the fundamental needs of each young man to safety, the right to personal development, equal opportunities of social, emotional, and social well-being as well as to increase awareness of multiculturalism and European social values. The main product: “Place for all of us!” promote the idea of European youth, the idea of freedom and equality among nations, gender and sexual orientation, religious and sends a clear message, “A society without discrimination.” As the final product is planned to be a video and photo exhibit that will promote solidarity and represent all sessions covered topics as well as some of the key moments that have marked the event. On our training course participants will develop new knowledge and skills in self-motivation, team work, entrepreneurship, tolerance, raising empathy and other skills of self-motivating and self-empowering through non-formal education, and also tend to create more and equal opportunities for young people with social obstacles in education and social envirnoment and their inclusion in modern European society. „Europe – place for all” was an extraordinary event hold in Novi Sad, Vojvodina, Serbia. In this training course youth participants from 13 coutries: Serbia, Armenia, Azerbajian, Turkey, Ukraine, Russia, Czech Republic, Romania, Bulgaria, Italy, Croatia, Albania and Poland took part. 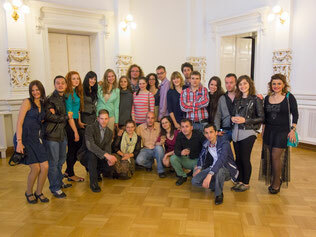 It was fully organized by European Youth Centre of Vojvodina and covered by Youth in Action sources. The main goal of the project was a promotion of tolerance and multiculturalism among young people with an emphasis on youth from disadvantaged (broken) families and their inclusion into society in the spirit of european values as well as education and empowering socially disadvantaged youth, meeting with current situation in European society and the motivation to continue active engagement and participation in society. As the final product of the project is planned to organize a video and photo exhibitions that promote solidarity and represent all sessions covered topics as well as some of the key moments that have marked the event. The photo exhibition will be posted online on organization website very soon. During this training course we had an amazing opportunity to discover cultural differences among European countries and expiernce cultural diversity. Nevertheless this cultural diversity did not disturb us to cooperate in reaching our main goals. I am really convinced that idea of intercultural cooperation is not only possible to be put into effort but also it is a must for furhter peaciful existance among European nations. people in every room. Organization stood on a good level.